Democrats hate the Koch Brothers. They believe the Koch Brothers are the root of all evil because they donate to Republicans and conservative causes. 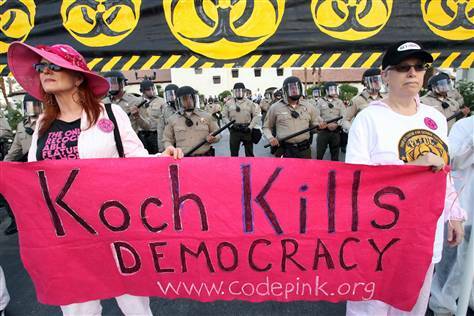 Democrats even threaten and protest against the Koch Brothers. Over the past twenty five years, from 1989 to 2014, Koch Industries has donated $18,083,948 in political contributions to Republicans. While that seems like a large sum, it only ranks them as number 59 on the list of top all-time political donors – behind 18 different unions. Remember this the next time you read an article by some leftist demonizing the Koch Brothers.